African Arts has come a long way from its previously ascribed tribal or primitive perceptions. As narratives continue to change, established and emerging artists from across Africa are very conscious of global affairs. As interests towards African Arts continues to grow, Lucie Chang Fine Arts and Mwimbi Fine Art Gallery will showcase three young artists from Zimbabwe currently at the forefront in contemporary visual practices entitled “Bridges” from Wednesday July 19. The three emerging artists from Zimbabwe are Tafadzwa Gwetai, Franklyn Dzingai and Anthony Bumhira. The exhibition will show their latest works, which come in the form paintings and screen prints. The role played by artists is to partake, create dialogue and initiate conversations pertinent in our times. Although, the artworks in this context are specific to a country and region, the exhibition creates a Bridge for opportunities between Africa and Greater China. Opportunities to learn, exchange ideas, share experiences and commonalities. Each artist presents us with a Bridge of his own in the form of education, tradition, culture, religion, citizenship, past and present, as they unpack and interrogate these common themes, guests are invited to walk through these Bridges and explore a multitude of lens. Chang Yue Lucie and Lee Garakara are curating the exhibition. Three emerging artists from Zimbabwe – Tafadazwa Gwetai, Anthony Bumhira and Franklyn Dzingai will be showcasing their works. 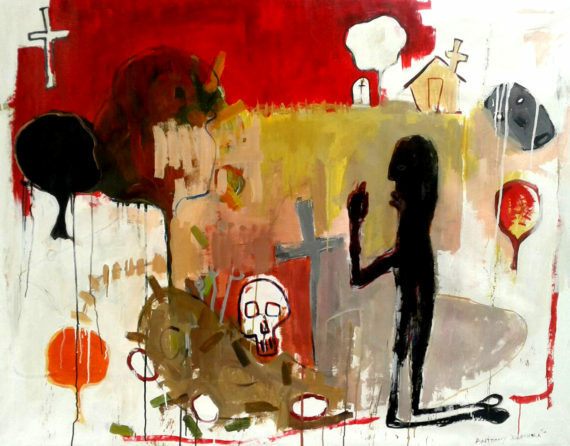 Tafadzwa Gwetai paints with mediums such as oils, mixed medium and found objects. Gwetai explores the human condition and how mankind has redefined themselves and their basic existence. He reintroduces and redefines mathematics with science and logic to create a new language – a language that challenges the very core of industry and its relevance to mankind. He views our existence as having been transformed into a virtual reality based paperwork and documentation. Existentialist philosophy such as that of Rene Descartes and Plato who challenged the existence of man and founded the concept of ‘I think therefore I am’. This influenced his line of thought to that of challenging the purpose and meaning of mankind’s existence. 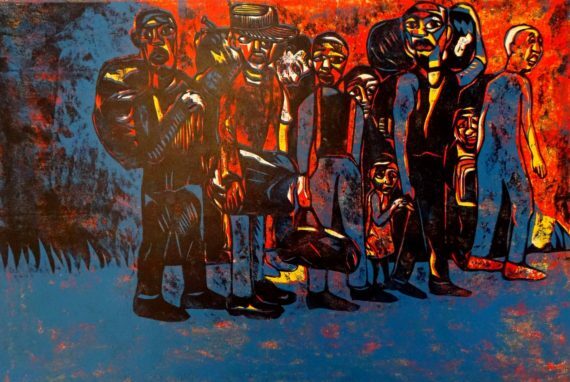 Franklyn Dzingai specialises in printmaking. He prefers using cardboard for printing relief using the reductive method. Collage and drawing are often incorporated into his prints. His prints are typically vibrant in colour and ornate in design. He sources his images from books, magazines, newspapers and family photos. Themes such as social interactions and personal memories are found in his prints. 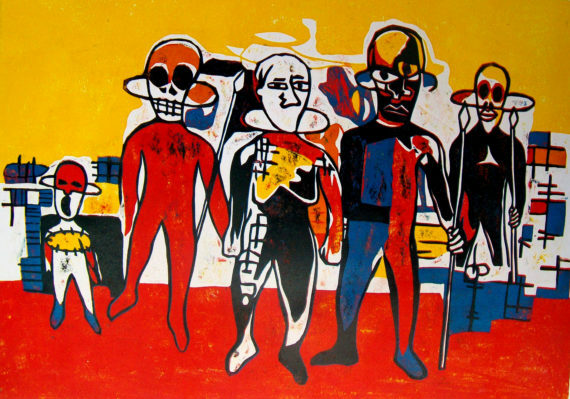 Anthony Bumhira, the youngest of the three artists but already has works in the permanent collection of the National gallery of Zimbabwe and around the world. Lucie Chang Fine Arts is founded by Lucie Chang, who has a rich background of Chinese contemporary arts within the art market with experience and expertise being transformed into her latest venture, encouraging aesthetic, spiritual, and social dialogues and diversity of art forms and offering a space for contemporary dialogues and social engagement. Lucie Chang Fine Arts has stable collectors resource; currently the collectors mainly are from Hong Kong, Shenzhen, Beijing, etc. Lucie Chang Fine Arts has good connections with academic institutions and Art centers in Hong Kong, the future exhibition program will cooperate with the Oil Painting Department of Guangzhou Academy of Fine Arts and OCT Shenzhen, Lucie Chang Fine Arts not only pays attention to the continuous art works presentation, but also attaches importance to the exhibitions of which are good curated works, will be valued by academic institutions, art gallery and curators. Lee Garakara was born in Harare, Zimbabwe. He attended and lectured at the Centre for Visual Arts, University of KwaZulu Natal (South Africa) from the period 2001 to 2009. After pursuing his post graduate studies, Mwimbi Fine Art Gallery was born out an urge to support the development of African contemporary Arts by realizing projects internationally. Mwimbi Fine Art Gallery is now based Hong Kong and aims to showcase contemporary African art of the highest form possible. By forging cross-cultural ties between Africa and Asia, Mwimbi Fine Art Gallery aims to engage with communities in ways that have yet to b explored. Through collaborations with industry professionals and institutions, Garakara aims to explore the elusive link between contemporary Art, African Art and its wider audience. Garakara is currently serving as curator and advisor for Mwimbi Fine Art Gallery and Mwimbi Consulting Hong Kong. The exhibition is supported by the Leap Initiative Philanthropies based in Hong Kong. With strategic partnerships and collaborations, the foundation aims to preserve and promote African Arts and culture within and outside Africa. The foundation is a non-profit organization that supports programs focused on emerging artists throughout the continent of Africa, Europe and Asia. As projects are realized, the foundation support structure also comes in the form of much need resources such as expertise, advisory and networking.